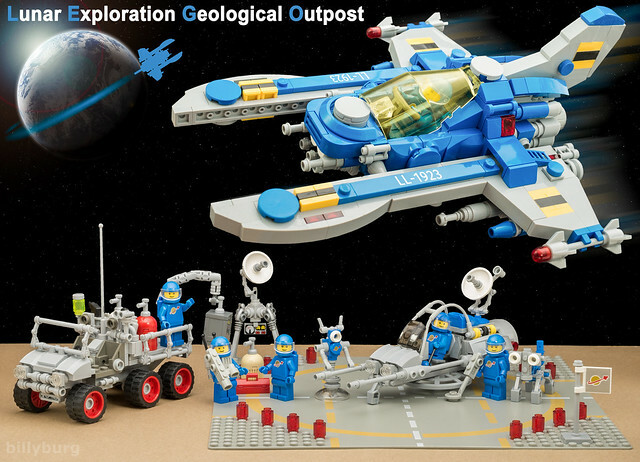 LEGO space MOCer billyburg recently posted his LEGO Ideas project, the Lunar Exploration Geological Outpost. I was very impressed with the build, and think it has a good chance at becoming a set if it reaches the required 10,000 supporters. You can help get it there by supporting it on LEGO Ideas. Billy was kind enough to answer a few questions about his project, read the full interview after the break! Would you mind telling us a little bit about yourself? UK AFOL. Lover of: climbing, whisky (especially single malts, but have tried whisky from all around the world and have yet to find a bad one), the great outdoors, science - especially Chemistry as that is what I trained for 7 years to be, nature, music, photography and most things small - especially those little plastic bricks! What inspired you to build this Ideas project? There are no Classic Space sets to buy at the moment! Whilst Benny and his Spaceship were kind of cool, his ship did not feel like the Classic sets of old. I bought a set and returned it unopened. No disrespect to The LEGO Group intended, they make the most wonderful fun creative 'system' in the world. I think any Classic Spacer will know what I mean though. What are some of your favorite designs/details? If you mean with respect to the set? I've always loved the blue classic space men. That's why I own so many of them (mainly the 2009 re-release). They always put a smile on my face, so by default they would have to be my favorite thing about the set. In terms of the rest of the Idea, its hard to pick out a favorite aspect. The most difficult aspects of the design process. As might be imagined a lot of my other Flickr models / uploads are intended as display rather than play things. Whilst I tried to make the models strong, realistic details and capturing the old CS charm were my top priorities. With this set, one of the greatest challenges was to make all the models look like all my previous ones, but using only legal connections and for them to be genuinely child friendly and strong. It was not an easy task. to be in just the right place to connect the canopy to the rest of the ship. Replacing the faux 6 wheel drive train and how I attached the windscreen of my original lunar jeep also had to be changed, although these were easier fixes. How long did it take you to design? How long? That's a difficult question. I'm always tinkering. I decided early this year I would do it, after messaging some Flickr friends for their opinions. It took about 4 months, fitting it in with other things. It was originally going to feature other models of mine: eg a 'legalised' Y-wing instead if the Vic Viper and a 'legalised' Lunar Walker instead of the Surface Skimmer/speeder bike. But I felt they would both be too fragile. Taking the photos was fairly easy. Processing them was not. Instead of a simple shot, I wanted to have some stars and a space backdrop. So I spent a good amount of time teaching myself some photoshop skills to get the desired effect. I'd like to thank you again for inviting me to write a few words about the project. To your readers: If you have voted, I cannot express my appreciation enough. If not, please consider voting anyway. :-) It is a sincere request to Lego that IF successful the royalties would go to my dad who is paying for a family member's on-going private medical care in the USA. Thanks for taking the time to answer our questions, Billy! If you would like to see this this project become an official set, please vote for it on LEGO Ideas.